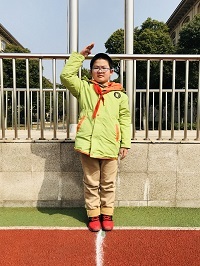 I'm Huang Runxi from the class two, grade three. As the flag-bearer this week, I am so happy to be here today! I am a happy boy who likes learning. I have many hobbies, chess, swimming, writing, taekwondo. Everything was done very well. In class, I listen to the teacher carefully. After class, I can finish my homework on time and carefully. I have always been good at school. I am respect teachers and unite classmates. I think studying in huishan jinqiao school is a very happy thing. So I like going to school very much. I think, as long as I study hard and actively, I will succeed one day. Teachers and students, I will cherish this honor, Be strict with yourself. 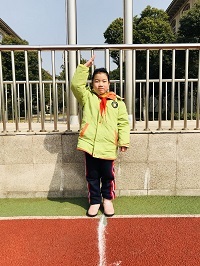 Hello everyone, My name is Fan Xintong, from Class2, Grade3. Today I'm honored to hoise the red flag and thank my teacher for giving me this chance, I will not fail my teacher's expectation. I have a lot of interests, Pipa, drawing and swimming... The most favourite is reading, it can enrich myself. This is me,a sunny girl, would you like to be friends with me? Good morning! 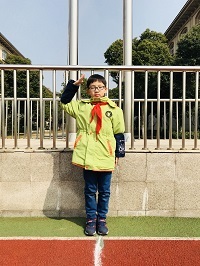 I am Wang Yihan from class 2 grade 3.Currently, I am the commissary in charge of studies in my class. I am a boy with a lot of hobbies and interests. I like PE,music and computer,but I like reading best. It can impove my handwriting and make my life meaningful and wonderful. I will try my best to become an excellent young pioneer.Thank you!